The Dunne family is falling apart. Eighteen-year-old Carrie has an eating disorder, Mark (16) is a stoner, and Ernie is ten going on forty. Their mother Katherine, a cardiac surgeon has spent far more time with her patients that with her children over the years. And the family suffered a tremendous blow four years ago when their father, Stuart, died during a scuba dive from the family’s boat. Adding to Katherine’s pain was the knowledge that Stuart was cheating on her. Almost a year ago, Katherine re-married, to celebrated defense attorney Peter Carlyle. Instead of sailing, Peter will be staying in NYC, preparing for a big trial. And visiting his mistress. 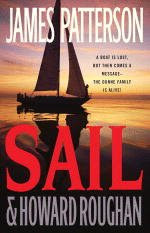 In an attempt to bring the family back together, Katherine organized a sailing vacation with Jake, Stuart’s brother as captain. Katherine and Jake have a past. The trip will be made aboard the family’s boat, recently taken out of storage, where it has been since Stuart’s death. None of the kids are happy about the trip, and even Katherine is questioning her decision. As well she should. How many things can go wrong with a setup like this? Plenty, beginning the first day out of port when Mark is caught with pot, Carrie tries to drown herself, and the boat springs a rather large leak. Then things get bad. Utilizing Patterson’s trademark staccato chapters structure, the pages seems to fly and the plot twists are many. The real problem, aside from a few incredibly implausible scenes, is that there’s really no one to like here. The characters, undeveloped as they are, are almost uniformly obnoxious. It’s not a spoiler to say that the kids learn the hard way how to pull together and act human. The adults don’t fare nearly as well, making their fates cause for little concern. While far from the best from either of these authors (YOU'VE BEEN WARNED) if you’re prepared to suspend a good deal of your disbelief you’ll find a fun escapist read here, perfect for a day at the beach.